Summary (from Goodreads): Little donkey on the hill, standing there so very still. Making faces at the skies, Little donkey close your eyes. A magical story from the hidden treasures of Margaret Wise Brown, perfect for sharing. Little Donkey on the hill, standing there so very still. My Review: I absolutely adore this book and luckily so do the kids. Rebecca Elliott’s illustrations are stunning, the soft edges to everything and bold yet gentle colours are positively strokable. I particularly like her portrayal of a mother cat curled up with her sleepy kittens and Tori loved the little pig, making me turn back to his page again and again so she could look at him. 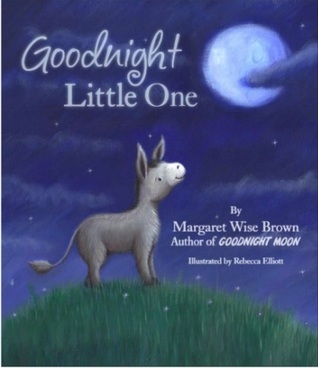 The story is very simple, you travel across the world saying goodnight to all the animals – from Little Donkey to monkeys, cats and sheep – before finally reaching the final pages where you say ‘Goodnight Little One’ to the child in the book, leading nicely on to tucking in your own child and saying goodnight. The story is written in lilting rhyme that is easy to read and flows nicely, making it a gentle read for the end of the day. There is a strong element of repetition which always goes down well with young listeners and readers and helps with the calming effect of the story. The font used for the writing is clear and easy to read, with some words highlighted in simple but beautiful script for emphasis. This works really well with the stunning illustrations and brings the pictures and words together nicely. The key thing for bedtime books is that they don’t drive you mad when you have to read them over and over again and this book ticks that box easily. I don’t mind reading it repeatedly and as Tori always asks for it again, I think she likes it too!